Olivier Hernandez, director of operations for the Observatoire du Mont-Mégantic and iREx coordinator, will start a new position as the director of the Planetarium Rio Tinto Alcan as of May 1st, 2018. M Hernandez had an important role at iREx, an institute for which he strongly contributed to create in 2014. After completing an engineering degree at École centrale de Marseille, M. Hernandez did a master degree in astrophysics at Université de Montréal and a PhD at Université de Montréal and Université de Provence. M. Hernandez is a specialist in the study of galaxies. He studied the dynamic of stars and gas in barred spiral galaxies during his PhD. He also developed strong expertise in astronomical instrumentation for galaxy and exoplanet observations. 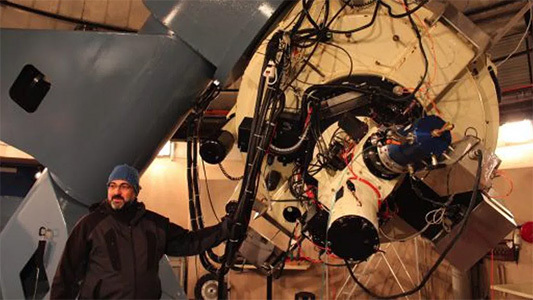 He was the coordinator of SPIRou and NIRPS projects, two instruments for major observatories in Hawaii and Chile that aim to detect small planets around small stars. Last but not least, he was in charge of NIRISS, the Canadian instrument on-board the James Webb Space Telescope. Olivier Hernandez in front of Observatoire du Mont-Mégantic Telescope in 2017. M. Hernandez has been devoted for many years in education and scientific communication. He appears in many radio and TV shows, and regularly gives conferences and presentations, many of which for schools. Since 2013, he also taught an introduction to astronomy lecture at Université de Montréal. He is committed to make science accessible to everyone and is involved in many projects to foster diversity in astronomy, including the creation in 2017 of the diversity committee of iREx. An accomplished triathlete in Université de Montréal’s club and a great actor with the troupe Histrion, M. Hernandez is involved in his community, organizing many activities such as the races Foulée des parcs d’Outremont. iREx researchers are really grateful for M. Hernandez’s great contributions to the institute and more generally to research in astronomy. They are confident this new position will allow him to make the Universe more accessible to the general public and are really excited about the opportunities tof collaboration with the Planetarium.